I’m pretty happy with this heel flap. I think I’ve managed to knit the cables so that they should flow right up into the pattern. We’ll see when I get the other flap finished. I think I’ll go with these flaps, even if they don’t flow right up into the pattern. These socks will henceforth be designated “clog socks” since I think those cables will not be very comfortable in a shoe. 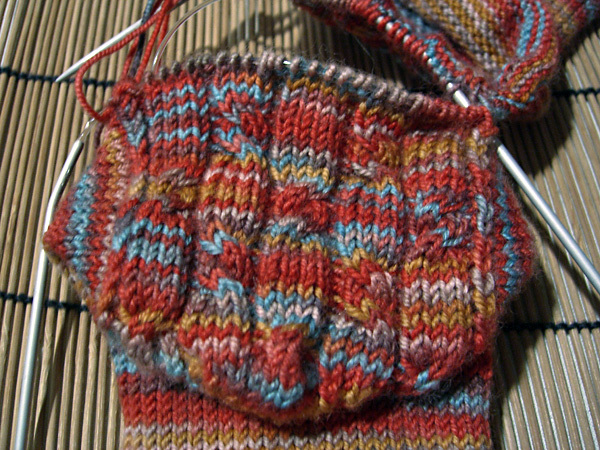 I tried the sock with the heel on this morning and it fits well. Except the toes. I’m still not really happy with the toes. In retrospect, it would have been better to have ended to toe increases just a few stitches shy of the correct total, and let the YOs in the ladders do the rest of the necessary increasing. And, to be fair, even though I like the look of the star toe / pinwheel toe / whatchamacallit, more standard pointy toes fit my foot better. I really love this colorway, though. I think these socks will probably see a lot of wear.